Wow,outstanding recording,it sounds so cristal clear,great job?? Nils is a MASTER !!! 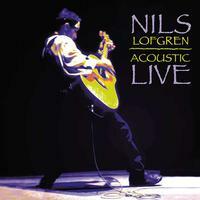 I have been a fan of Nils Lofgren since his first album. I purchased "Acoustic LIVE" on the original RYKODISC label back in the 90's. Could not believe how great the performance was then and how phenomenal this reissue sounds. Cannot wait for the SACD. Want to compare to the original disc. Note: if you love great acoustic guitar and poetic lyrics, then this album in any form, should be in your collection. On a recommendation at my local record store, I took a chance on this one as I was unfamiliar with Nils Lofgen's solo work. Very happy I did! The music is meaningful, well performed, and all around excellent. This is why I still frequent my local record store! I would have never picked this up otherwise. As far as sonics? An absolute incredible live recording. Whoever engineered this one got it right. Digital or not, it doesn't matter to me. I only can report on what I hear, and I can't get enough. Thanks to whoever made this release happen. Stunning, amazing recording, amazing music! I have been hoping this one would be released on vinyl for years. Nils truly is one of the great under appreciated talents. If you are a fan of great acoustic guitar music, don't miss this one!